Dracula aka The Horror of Dracula (1958) is Hammer's take on Bram Stoker's classic. Also, Grand Moff Tarkin and Alfred Pennyworth vs. Saruman! Jonathan Harker arrives to tend the mysterious Count Dracula's library. We soon learn that he is there to kill the Count. After a fight with one of his brides, Harker is saved by Dracula. 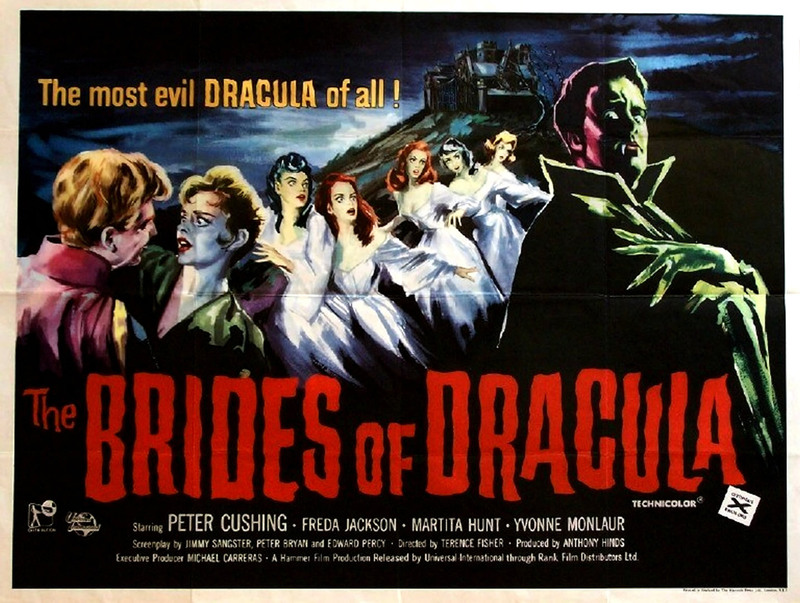 Harker finally discovers the crypt, but in killing the bride he awakens Dracula. Later, Doctor Van Helsing arrives looking for his young friend and goes to Castle Dracula to meet his friend or face his foe. This film is not what I was expecting, but I do appreciate that they thought out all of the changes they made. They also keep some of the spirit of the novel with Mina getting in trouble due to the men being distracted and Arthur and Helsing bonding over protecting Mina. They even have to race back to the castle to defeat him at the end. At first I thought the changes they made were strange, but I soon got sucked into some great acting and storytelling. Jonathan Harker is Lucy's love and Van Helsing's vampire hunting partner. He has some surprising moments and I'd rather not go too deeply into his character. Arthur Holmwood is Mina's husband and Lucy's brother. He starts off as a bit of a prick, sort of like faux-Harker from the Universal Dracula. Unlike faux-Harker he is more susceptible to reason (and Van Helsing shows him definitive proof). After that he becomes much more enjoyable as a member of the team. Doctor Van Helsing is a professional demon hunter in addition to his doctorates. He is also played by the cool and suave Peter Cushing. This Helsing is methodical, but still learning about vampires. He seems to capture the assertive yet comforting air of the novel's Helsing and add some charm. Each kill matters and gets the remorse it deserves. He also gets much more dynamic action scenes where we get some creative vampire deaths (finally). Lucy is Jonathan's fiance and Arthur's sister. She fulfills the role of willing victim akin to Kay in Son of Dracula. Van Helsing makes an interesting comparison of vampire victims to drug users and Lucy does a fine job exemplifying that. Sadly, like many Hammer pictures, this idea isn't really explored beyond her character. Mina is Arthur's wife and she has the limited role of damsel in distress. Vampire films really haven't been progressive for women's rights. Count Dracula is an itelligent monstrous fiend and played by Christopher Lee. This is Lee's break out role and it isn't hard to see why. Much like the novel, Dracula has limited appearance time, but he is fantastically menacing. He is either stalking a victim or attacking a foe. His menace is apparent in all his scenes. Dracula's castle is not the drab thing we've seen in the Universal series, but a lush and extravagant home. The countryside locations are gorgeous. We are in east Germany, I think, and though they mention Transylvania, they also mention the German towns that were in Frankenstein. 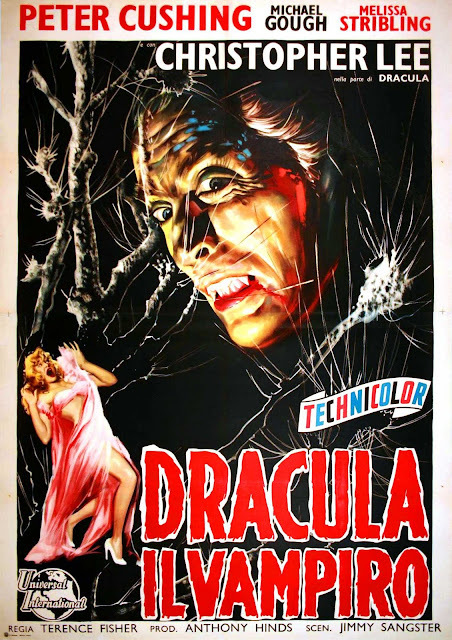 The ending is the epic climax you'd expect from a Dracula film with a really cool final death that many weaker film have tried to copy and failed. The finale and the aftermath are both must sees. This is the Dracula that is remembered and copied for modern audiences. This film is a great showing of an adaptation done right. Some characters are switched around, but much of the spirit remains the same. Add some great action, solid storytelling, and interesting characters and you've got a great movie. The Brides of Dracula (1960) continues Van Helsing's vampire eradication story as he tracks another vampiric menace. A girl enters a town and we see the townsfolk afraid of keeping her. Soon she abducted to Castle Meinster by the Baroness. While there the girl notices a handsome young man in a lower part of the castle. He seems to try to commit suicide to she runs to him. He convinces her to free him and when she does, he doesn't appear to be all he promised. She flees and ends up in the woods. Soon a carriage approaches and Van Helsing the demon hunter appears. 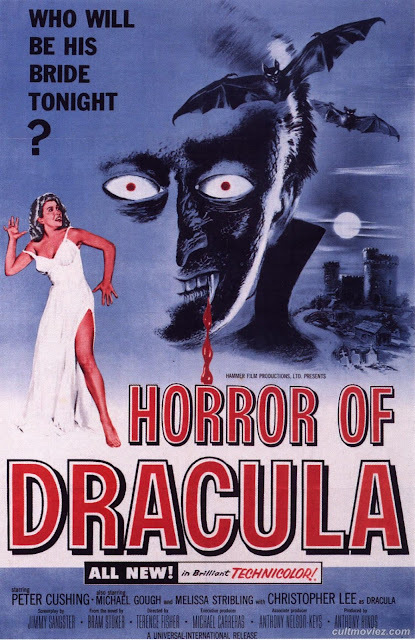 This film is a loose follow-up to the last one and suffers from a lack of Dracula. This has nothing to do with anyone other than Van Helsing. He fights the new vampire and his wives, not Dracula's wives. It is a decent action piece, but ends as a retread of the first. Van Helsing is awesome as always. He seems to have more patience in this, since he is willing to put up with Marianne's stupidity. He laso has even more action scenes that paint him as the John McClane of the vampire world. Marianne Danielle is gullible young woman who release Baron Meinster from his mother's imprisonment. Her story could be interesting if she didn't seem so stupid. She meets the Baron and she's instantly okay with freeing him. Then he kills his mother and Marianne consents to marry him. There isn't even any hypnotism shown. Other women are there as eye candy and other potential victims. Oh and one looks like Michael Jackson. Baron Meinster is the poor man's Dracula. He tires to be menacing, but how bad can he be when his mom managed to keep him chained in another part of the tower? His look has aged badly and he doesn't have much menace. Meinster castle has some nice large and beautiful sets. The game also has some excellent location work with the town and the windmill. Perhaps the most creative vampire death occurs at the very end of this film. I loved that, but Helisng doesn't kill all the vampires or at least it isn't shown. Cool, but incomplete. Not as good as the first, mostly due to the fact that Baron Meinster is no Dracula. Van Helsing has some great action scenes though, so if you want some interesting vampire deaths and can wait to the end, see this. Also, another fine Peter Cushing performance.